Over the past year, we at the Robert Wood Johnson Foundation (RWJF) have been sharing the vision of building a Culture of Health with people across the country. We’ve discussed it with health care professionals and care providers. We’ve talked to educators and policymakers, business leaders, community organizers, faith communities, moms, dads and others. But perhaps even more important, we have listened. We’ve listened as they have told us how they are picturing themselves living in a Culture of Health, and that they are eager to help build the opportunity to get and stay healthier into the everyday actions of their lives. They want to play their part in creating a nation in which one’s ethnicity, income or ZIP code does not hamper the ability to eat fresh food, live on safe streets, sustain emotional and mental well-being, or find and afford health care. They envision schools and workplaces where, instead of sitting all day to learn and work, we can remain active and involved in improving ourselves and the overall well-being of our communities. Last year, the Merriam-Webster Dictionary named “culture” its word of the year, noting that people use the term broadly. It can mean art and music. It can mean history and heritage, and it can mean the general ways things are done within a family, a community, a nation. The word “health” also has many meanings, so a Culture of Health can look very different to different people—and that’s the way it should be. Our nation is splendidly diverse, and a national movement toward better health must reflect our individual beliefs, our family customs, and our community values. RWJF’s goal is to weave these many threads of health into the richly textured fabric we call American life. We hit the road in 2014, including a visit to TED in Vancouver, B.C. We were there to ask, listen and learn. We spoke with Boston Marathon bombing survivor Adrianne Haslet-Davis about her personal vision for building a Culture of Health. A single instrument cannot perform a symphony, and a comprehensive Culture of Health cannot be built by the health care system alone. It is going to take the input and innovation of many. In California, the Live Well San Diego initiative is a prime example of how a crosscutting approach can improve the well-being of an entire county. In 2010, using data about the health of its residents, a coalition of community members, businesses, schools, faith-based organizations and local government set 10-year goals for improvement. Then, working together, they began building safer and more resilient communities by encouraging physical activity, turning parking lots into parks, helping seniors age in place, promoting community policing, and creating plans for future growth with health in mind. Data tracking the county’s progress is shared openly with the public and the entire community is invited to help move the needle forward. On the other side of the nation, Durham County, N.C., once known as the heart of tobacco and textile country, is becoming a world-renowned center of biotechnology, medical care, and higher education. The change has benefited many. But it also has underscored the community’s economic and health disparities, including uneven rates of obesity, heart disease, unemployment, poverty and education. Community leaders knew they had to work together with a common purpose to address these issues. But knowing it and doing it are very different things. “Some people came to the table with great hesitancy, feeling if they gave over their ideas to others—the things they had worked so hard on—they would lose their identity,” says Durham County Public Health Director Gayle Harris, explaining the early challenges she and others faced when they decided to create a community-wide coalition called the Partnership for a Healthy Durham. “It takes work to connect the dots and get people to recognize that everyone has equal weight and has a unique role to play. But it can’t be about them. It has to be about the greater good." Today, the Partnership for a Healthy Durham is an active coalition of more than 500 individuals, health care providers, elected officials, university researchers and civic organizations that meet regularly to assess data about the community’s health, set priorities, and tackle the issues together. Over the past decade, the partnership has established a network of free health clinics and created 32 miles of dedicated bike lanes and walking trails. The school district has turned 30 acres of empty land into a vast garden, where students can grow, harvest and learn about healthy food. A Veggie Van works with churches, child-care centers and other organizations to deliver fresh produce to residents with limited access to nutritious fare. The partnership has also addressed early childhood education and helped to boost high school graduation to 80 percent. Additionally, in a historic move, the county that once considered tobacco its economic lifeblood recently banned smoking on city and county property, in city parks and sidewalks near hospitals and bus stops. Partnerships like these are serving as models for the rest of the nation by sharpening the connection between health and a strong, sustainable economy. Through programs like the RWJF Culture of Health Prize, our Foundation will continue to spotlight and support communities that are committed to improving the overall well-being of their residents. We also will continue to help these communities connect so they can share successes, challenges, tools and resources. Durham, N.C., has embraced the role of education and training in improving the health and well-being of its residents. Durham County is one of six winners of the 2014 RWJF Culture of Health Prize. Building a Culture of Health calls for action within and across sectors—because progress in one area will advance progress in another. But what areas of action should America work toward? How do the actions relate to one another? And what specific measures will help our nation gauge improvement? Making Health a Shared Value, measured by indicators such as the percentage of people who strongly agree that health is influenced by their peers and their communities and the percentage who indicate they have adequate social support from family and friends. Fostering Cross-Sector Collaboration to Improve Well-Being, denoted by measures like the number of local health departments that collaborate with community organizations and employers who promote better health in the workplace. Creating Healthier, More Equitable Communities, using measurements such as the number of grocery stores, farmers’ markets, and safe sidewalks in communities; the ratio of children attending preschool; and the affordability of housing. Strengthening Integration of Health Services and Systems, gauged by measures such as the percentage of people served by a comprehensive public health system and the percentage of physicians sharing electronic data with other clinicians, health systems and patients. It’s our hope that these Action Areas will spark a productive national conversation about the physical, social, economic and emotional conditions that influence health. We also hope the Action Areas will kindle a greater sense of both individual and shared accountability and inspire different sectors to work together to improve outcomes and raise America’s health to the level a great nation deserves. When we say we are all in this together, we need to mean it. With the action model as our compass, RWJF will focus on long-term and near-term priorities. Our work will reach across sectors integrating areas we believe will mobilize a cultural shift toward healthier living. If health is to become a fundamental element of our everyday lives, we must strengthen the connections between our health care and public health systems, as well as the other components of health in our communities. Care and treatment provided by medical professionals has greater impact when it is supported by infrastructure designed with health in mind: green spaces that are safe and welcoming; schools that are also used as community centers; corner markets that sell nutritious food; and transportation systems that take us where we need to go and allow us to drive less. Building these bridges between health and health care will require us to establish partnerships that have never existed before. One example of an innovative alliance helping to improve community health is the National Medical-Legal Partnership program. It connects medical practitioners with lawyers who can help patients address issues that range from compelling landlords to fix problems like broken heaters or leaking pipes, to domestic violence, unemployment and environmental risks. Another example can be found in Oklahoma, where bridging health and health care is high on the state’s list of priorities. So high that seven years ago the University of Oklahoma medical school in Tulsa changed its name to the OU College of Medicine’s School of Community Medicine and remodeled its curriculum to place more emphasis on community clinical care and community health planning. Governor Mary Fallin signed a bill into law banning smoking in all state buildings and state parks. Every child in Oklahoma has access to free pre-kindergarten classes starting at the age of four, and state officials are considering lowering the age further. And, a combination of private and public funding recently allowed the Oklahoma City-County Health Department to open a wellness campus for the general public that not only offers clinical care, but also houses a YWCA, a career training center, a food bank, playgrounds, walking trails and free weight loss and nutrition classes. Our Foundation is eager to help develop more of these unique partnerships, bringing together health care, public health and other community systems. Medical-Legal Partnerships have been established in 262 health care institutions in 36 states. Is there one near you? At RWJF, we have the audacity to believe that everyone in America has the right to live in a nation where the opportunities to achieve, improve or reclaim health are abundant and available to all. No one should feel that better health is beyond reach or that it is something not deserved. One of the Foundation’s key priorities is to listen through our partners to learn what a Culture of Health means to others and allow the direction of the movement to emerge from the input and innovation of many. We intend to help our nation increase its demand for healthy places and practices by promoting systematic change in policy, laws and living conditions. We will provide data and tools that communities, agencies, organizations, institutions and individuals need to make better health a priority at all levels. And, we will shine a spotlight on the places and people who are leading the movement. One of these individuals is David Sagbir, MD, a cardiologist from Columbus, Ohio. He is the founder of a program called Walk With a Doc, which started out of sheer frustration. When he met with his patients, he would stress that their lifestyle choices were a matter of life or death, and they had to take charge of their own health. In the office, they would promise to start exercising, to watch their diets and quit smoking. Six months later, they’d be back and their promises hadn’t stuck. Sagbir knew he needed to come up with a better way to motivate them. So one day he asked a patient: “What are you doing Saturday morning? Do you want to meet me and my family in the park for a walk?” And that’s how it started. With one patient, walking and talking about getting and staying healthier. Word of Sagbir’s walks got out and soon other doctors in other communities invited their patients to walk. Now there are 150 Walk With a Doc programs across the country and the program is striding across Europe, India and Russia. How can we harness data for healthier American communities? We cannot declare success if a Culture of Health leaves some behind. To improve the health and prosperity of our entire nation we must eliminate health disparities, which are often tied to economic and social factors. Personal choice and responsibility play a key role in attaining and maintaining health. However, the choices people make depend on the choices they have. We will work with others to identify and strengthen evidence-based solutions that expand equal opportunity for health for everyone in the United States, such as the growing body of research showing that when supermarkets and farmers’ markets with affordable produce are introduced into communities that previously had few nutritional choices, the consumption of vegetables increases. One example of an effective evidence-based program addressing disparities is the EMS Corps of Alameda County, Calif. 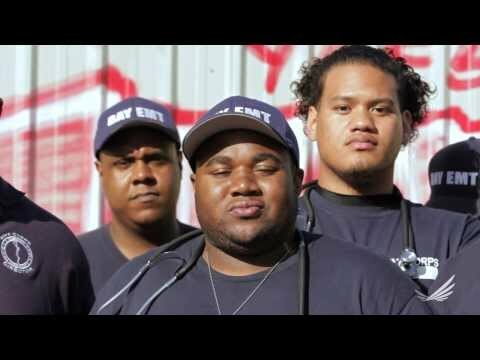 It attracts and trains talented young men of color from some of the state’s most under-resourced communities to be emergency medical professionals, creating a diverse and highly skilled cadre of professionals with roots in the neighborhoods they serve. The EMS Corps offers more than just traditional EMT training. It also provides students ongoing support through life coaching, transformative mentoring and mental health services, giving them greater opportunity to shape and control their future. Our Foundation is committed to becoming a leader in eliminating health disparities in America. To do so, we will fund research in this area and work alongside others in a collective push to build a strong action network of multidisciplinary leaders in the field. The Alameda County Public Health Department’s EMS Corps program is helping local health care providers expand and diversify their workforce by training young men and women from the community to be emergency medical professionals. Healthier workforces help companies stay competitive. Healthy communities attract economic growth, and healthy products and practices build new market opportunities. Increasingly, organizations around the globe have embraced these views. The World Economic Forum has declared that health must be seen as “an economic eco-system” that directly affects a nation’s employment, education, gross domestic product and competitiveness. With that in mind, it recently established an initiative called the Future of Healthy aimed at strengthening industry’s focus on health. At RWJF, we have recognized for decades the critical role that American industry plays in creating a Culture of Health. In 1946, our founder General Robert Wood Johnson wrote: “Business... must make its contributions to the convenience, beauty and healthfulness of the community in which it operates.” Believing that his statement resonates today more than ever, we intend to continue to strengthen our visibility and engagement in this critical arena. Last year, we were proud to have played a part in the historic announcement that CVS Health would stop selling cigarettes and other tobacco products at its stores nationwide, and we will work to encourage others to follow in CVS Health's footsteps. To further deepen our participation with the business field, RWJF will support research and evaluation that makes a sound business case for promoting good health. We will explore which health indicators matter most to the bottom line. We will identify how healthier employees can boost productivity, innovation and profit. And we will work with others to highlight and build on the influence of trailblazers who are leading the way in fostering a Culture of Health in their own communities. Good health can also be good business. CVS Health Vice President and Medical Director Troy Brennan explains how. To build a Culture of Health we need to ensure that all families, especially those with young children, have access to the social and emotional building blocks of physical and emotional well-being. We must work to reduce the number of children exposed to adverse experiences of extreme poverty, family violence, substance abuse and other forms of toxic stress that can compromise their lifelong health. This will require unprecedented collaboration between homes, schools, child-care centers and health care clinics. Parents, guardians, educators and caregivers must work in closer collaboration to give our youngest children the support they need to grow up as healthy as they are able. At RWJF, we will work to highlight the strong connection between childhood development and good health through documentation and research linking the early development of social and emotional well-being to success in later life. We will continue to work alongside organizations such as the Council for a Strong America™, the National Governors Association and the Alliance for Early Success to provide families the support they need to help kids thrive. We also intend to build new partnerships that will broaden our reach in this important field. Traumatic childhood events like abuse and neglect can create dangerous levels of stress and derail healthy brain development, resulting in long-term effects on learning, behavior and health. For more than 40 years, RWJF has recognized and supported the critical role that scholars, researchers, clinicians and leaders play in improving health. We have fostered the work of forward thinkers, encouraging them to conduct research, shape policy and find solutions to our nation’s most pressing health problems. We have supported them with mentoring and leadership development and we will continue to do so. To align our future investments in human capital with the sweeping vision of building a national Culture of Health, we are creating new programs that will engage sectors beyond health and health care, promote teamwork and collaboration, advance diversity and leverage technology to support robust networks and enhance mentoring. The new programs will connect clinicians, scholars, researchers and leaders from medicine, nursing and population health with experts from sectors such as architecture, education, urban planning, transportation, social justice and housing with the goal of working together to address health challenges facing individuals and communities, and to drive change toward a Culture of Health. To further encourage idea sharing and cross-sector dialogue, the Foundation launched the RWJF Leadership Network in 2014. It has grown into a dynamic online community where more than 8,500 practitioners, scholars, policymakers and community activists are exchanging ideas, promoting research and collaborating on initiatives to advance a Culture of Health. It is a prime example of how a movement can gain momentum through social media, and how a new generation of leaders can make the most of new and emerging methods of collaboration. We are working across sectors both within and outside the Foundation to achieve these long-term goals. Eight years ago, RWJF committed $500 million to seed a movement toward reversing the epidemic of childhood obesity in our nation and we are starting to see real signs of progress. Nationally, the troubling rise of obesity rates in all kids has ceased, and when it comes to our youngest children—those between 2 and 5 years old—the levels have started to fall. But these developments are fragile and uneven. White children and children living in higher-income areas are seeing a greater decrease in obesity rates than others, but more than 25 million children remain at risk for developing high blood pressure or type 2 diabetes. That is why RWJF has committed an additional $500 million to continue to expand efforts to help all children in the United States grow up at a healthy weight. This will bring our total investment over the past decade to more than $1 billion. We pledge to keep lifting up and learning from the places that are successfully driving down rates of childhood obesity, and we are also going to pursue new directions to further speed up and spread this progress. Ensuring that all children enter kindergarten at a healthy weight. Making a healthy school environment the norm and not the exception across the United States. Making physical activity a part of the everyday experience for children and youth. Making healthy foods and beverages the affordable, available and desired choice in all neighborhoods and communities. Eliminating the consumption of sugar-sweetened beverages among children under the age of 5. It is critical for our nation to stay the course so we can secure a healthier future for all of our children. RWJF committed $500 million over the next 10 years to expand efforts to ensure that all children in the United States—no matter who they are or where they live―can grow up at a healthy weight. A central part of building a Culture of Health is making sure that high-quality health insurance is affordable to everyone. Since the implementation of the Affordable Care Act, the uninsured rate in America has dropped 4.2 percentage points, with more than 7 million new enrollments through the federal and state marketplaces. This is impressive progress. But we cannot let the momentum wane. We will continue to support efforts designed to provide assistance with enrollment, especially in hard-to-reach communities, including the population known as the "young invincibles” that often responds best to serious issues through humor. We will continue to provide technical assistance to state government agencies expanding coverage opportunities, and conduct research and analysis to track the nation’s progress toward getting more people insured. If we are to build a Culture of Health, we must continually ask whether our nation is getting the most out of its investments in population health and health care. Our nation spends more than $2.9 trillion on health care but continues to lose $225 billion in productivity each year because of poor health. At RWJF we are addressing the issue of value by concentrating on strategies that will improve the quality of care and reduce wasteful spending. This includes a focus on changing how we pay for and reward value. It also calls for creating a care delivery system that rewards value rather than volume, and increasing consumer engagement and shared decision-making. We also intend to continue making the case for more investment and efficient spending in public health. A good example of a program with many of these value goals is Choosing Wisely™, an initiative of the ABIM Foundation, designed to educate clinicians and patients about whether certain tests or treatments are really necessary. The program is sparking conversations and changes in treatment patterns. Cedars-Sinai Health System, for example, has hardwired 180 Choosing Wisely recommendations into their electronic health records system. Each time a physician attempts to order a test or treatment on the Choosing Wisely lists, they receive an alert. Similarly, a physician ordering an antibiotic for a patient suffering from an ailment like bronchitis will be reminded that antibiotics are ineffective for healing viral illnesses. The alert system sends more than 300 reminders to physicians each day. It has realized positive changes, such as a 31.5 percent decrease in the rate of new orders for benzodiazepine (i.e., sedatives, muscle relaxants) for patients over age 65 within two months of installing the alert system. Our work will continue to identify ways to increase transparency and availability of data showing cost and quality of care. We also will work to help patients understand and use their personal health data to become more engaged in their own care and transform the patient-provider relationship for the better. 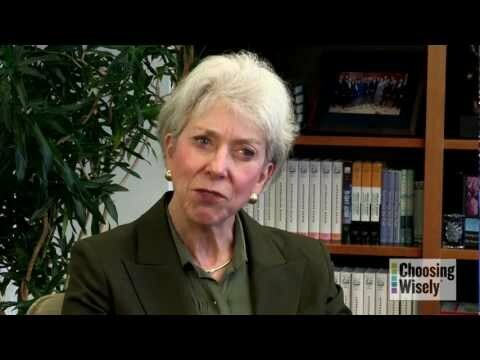 The ABIM Foundation's Choosing Wisely initiative, through a Robert Wood Johnson Foundation grant, awarded funding to 21 state medical societies, specialty societies and regional health collaboratives to help physicians and patients engage in conversations aimed at reducing unnecessary tests and procedures. Every day, as I continue to share the vision to build a Culture of Health with others, I think about my five-year-old granddaughter. Over the winter holidays, we were having a conversation about what kind of snack we should leave out for Santa. I suggested the traditional fare: milk and cookies, or maybe brownies, eggnog or gingerbread. She looked at me aghast, saying in her most serious, adult voice, “No Grandma, we can’t leave him those kinds of food. We should leave him broccoli, carrots and brussels sprouts. We need Santa to be healthy, because the elves can’t do it all by themselves.” She was so adamant that I almost laughed. But in truth, I was bursting with pride. She’s already developed a sense of what a Culture of Health means to her. And I’m convinced that by working together in the coming years, we will make a Culture of Health a reality. Want more articles, interviews and research about building a Culture of Health? Get our weekly newsletter, Advances®.